A couple more photos of the Mira Paradis Drive Bridge. The arch ribs are supported by reinforced concrete walls that are in front of the rubble retaining walls. The walls extend up to also support the deck. The bottom of the deck has little chevrons for decoration, but I think they detract from the clean appearance at the top of the arch ribs. There are several more of these open spandrel arch bridges with rubble retaining walls in El Dorado County (as we will see). El Dorado County is so big and it has so many bridges that the County eventually hired several Caltrans engineers just to manage their bridge database system. 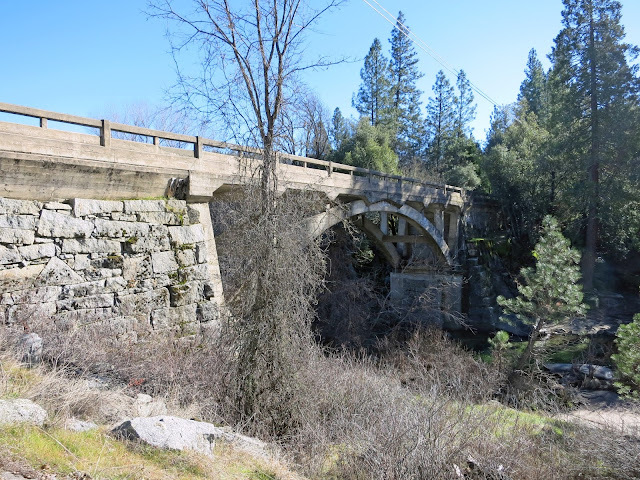 The Mira Paradis Drive Bridge is a 25.3 m (83 ft) long single span arch bridge over the Middle Fork of the Cosumnes River and it was built in 1924 by El Dorado County. El Dorado County, California Bridges: Mira Paradis Drive Bridge across the Middle Fork of the Cosumnes River (2) by Mark Yashinsky is licensed under a Creative Commons Attribution-NonCommercial-ShareAlike 3.0 United States License.